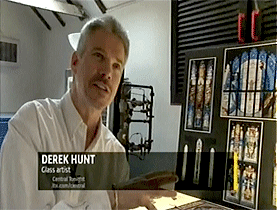 In this television interview artist Derek Hunt talks about his work on designing stained glass for churches and other public places including shopping centres, GP surgeries and large public buildings. This entry was posted in design, publications. Bookmark the permalink.